Michael Drayton was born of humble origins early in 1563 near Nuneaton, Warwickshire. He was a prolific poet and part of a circle that included the likes of Ben Jonson, and possibly also Shakespeare. Little is known about his early life, beyond his service to Thomas Goodere of Collingham, Nottinghamshire, in 1580. Some nineteenth- and twentieth-century scholars suggested that Drayton might have studied at the University of Oxford but there is no evidence that he did so. By 1591 Drayton was settled in London and produced his first book, The Harmonie of the Church. 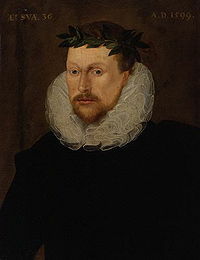 The first of his historical poems, Peirs Gaveston, Earle of Cornwall, was published two years later, followed in 1594 by Matilda: the Faire and Chaste Daughter of the Lord Robert Fitzwater, an epic poem in rhyme royal. Although he was seemingly in favour at the court of Elizabeth, Drayton experienced a change of fortune under the new monarch King James following his ascension to the English throne in 1603. In 1612 Drayton published the first eighteen songs of his longest poem, Poly-Olbion, or, A chorographicall description of all the tracts, rivers, mountaines, forests, and other parts of this renowned isle of Great Britaine, on which he had begun working in 1598. In March 1627 he was involved in a bizarre-sounding lawsuit, accused of “commending a woman’s private parts”. Although the verdict from the case is lost, such an act would be totally out of character for Drayton, and the evidence suggests that the woman who claimed to have witnessed the act was lying. In late-seventeenth-century opinion, Michael Drayton ranked only slightly below Sir Philip Sidney, Edmund Spenser, and Ben Jonson. He was much read and published in his own day, though less so in the eighteenth century. However, by the end of his life, the didactic verse and historical epics in which Drayton specialised were no longer in fashion. Drayton held an interesting view of the poet as a spokesman for public values. The division between poetry and history had broadened so that epic poetry no longer dominated as a way of representing the history of a nation. Drayton understood this and actually recorded in his own works the changes in the role of the poet during his lifetime. He died in London in 1631 leaving an estate of £24 2s. 8d. He was buried in Westminster Abbey, and had a monument erected to him by the countess of Dorset.